Being brought up within a mile of the West Coast Mainline as it climbs the fells I've been a life long fan of the unassuming but nevertheless mighty AC Electrics. From a young age watching them on the tough north bound restart out of Oxenholme, climbing Grayrigg and Shap and rolling into the Citadel. 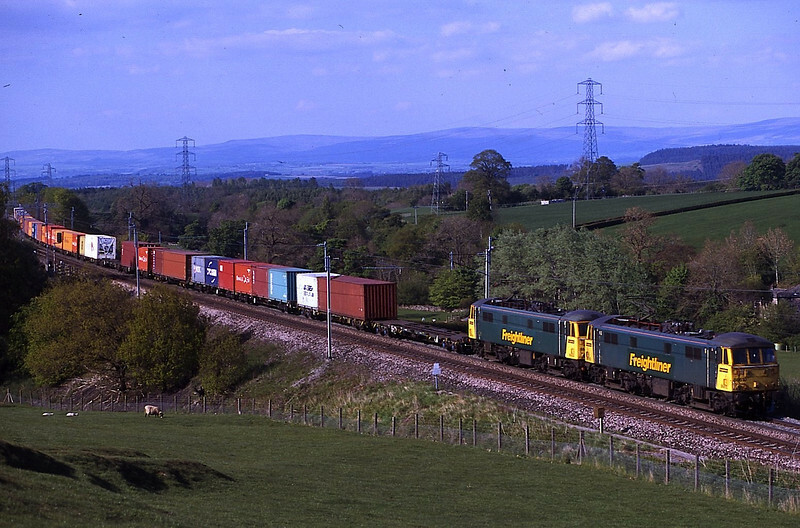 After getting my first SLR camera in 1998 I set about recording them in the Cumbrian landscape in the days when you didn't need any 'gen' as everything was loco hauled. Now with all passenger services in the hands of units running a fairly intensive timetable we now only have a handful of daytime freights to go after. Having persisted with diesel traction for some time particularly for the intermodal's some freight operators have now returned to electric traction because the far superior performance on the climbs allowing for better pathing. Also a new chapter has now opened with DRS having introduced their ten Class88 AC Electro-diesels into service. 86610 and 86604 pass Strickland with a Coatbridge to Crewe freightliner, 3/5/2011.